The information provided in this Blog is to be used for educational purposes only. The Blog Admin is in no way responsible for any misuse of the information provided. A dictionary attack is when a text file full of commonly used passwords, or a list of every word from the dictionary is used against a password database. Strong passwords usually aren’t vulnerable to this kind of attack. In the following example, I will use Brutus, a very common password cracker, to show a dictionary attack against an ftp server. Brutus is a Windows only program, but at the end of this chapter I will list a couple more password crackers, some of which are made for Mac, Windows, and Linux. Before I get into the example, you must first know what an FTP server is. FTP stands for File Transfer Protocol. FTP is a simple way to exchange files over the internet. If a hacker got FTP access to my website, he could delete/upload anything he wants on my server. An FTP address looks similar to a website address except it uses the prefix ftp:// instead of http://. I set up an FTP server on my computer so I could demonstrate. You can get Brutus at Go here. 1. First the hacker would choose a target. In this case it’s my home computer and the IP address for your home computer is 127.0.0.1 . 2. 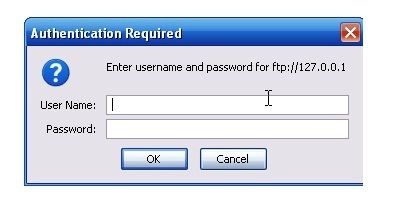 By going to ftp://127.0.0.1 I get a pop-up box asking for a username and password. 3. Next the hacker would launch a program similar to Brutus and attempt to crack the password. 4. In the target you put the IP address of the website and to the right select the appropriate option, which in this case is FTP. 5. The default port is 21 but some websites change this to make them a little more secure. If you find out that the port isn’t 21, you can find the right one by doing a port scan. We will get into this later in the book. 6. If you don’t know any of the usernames for the FTP server, then you will have to get a list of the most common usernames. 7. For a dictionary attack you will have to choose the pass mode Word List and browse and select the file containing your word list. You can get some good password lists at Here. Below are examples of what a username and password list might look like. 8. Once you hit Start the program will attempt to connect to the server and begin to try all the possible combinations from your lists. 9. If you’re lucky, eventually it’ll get the right Username:Password combination. As you can see below, it got the correct combination of username – admin and password – password. 10. A smarter hacker would use a proxy when using a program like this. What a proxy does is cloaks your IP address by sending your connection request through another computer before going to the target. This is a smart idea because as you will see in the image below, Brutus leaves a huge log of your presence on the target server. 11. In place of the IP address 127.0.0.1 would be the hackers IP address. Footprints like these get a hacker caught and into a lot of trouble with the law.